As you are reading this, I will be in a field somewhere singing my heart out -okay maybe not at 9am in the morning but I will be in a field somewhere ready to start my weekend at V festival. 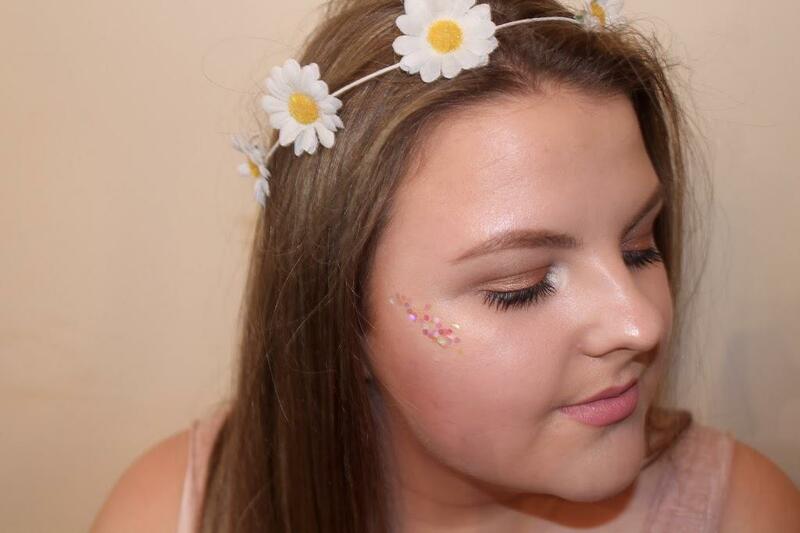 I have never been to a music festival before so I have no idea what to expect, however what I do know is that at festivals you can be as creative and fun as you like when it comes to makeup. 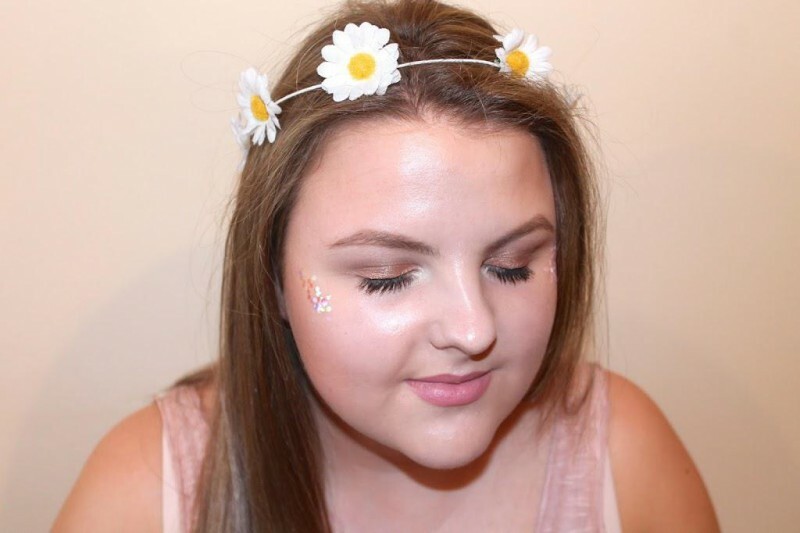 I have created a makeup look that is simple and easy to do but is also fun and festival inspired. I am only going to be taking one eyeshadow palette with me to save space, so in this tutorial I am going to be using mostly mac eyeshadows. 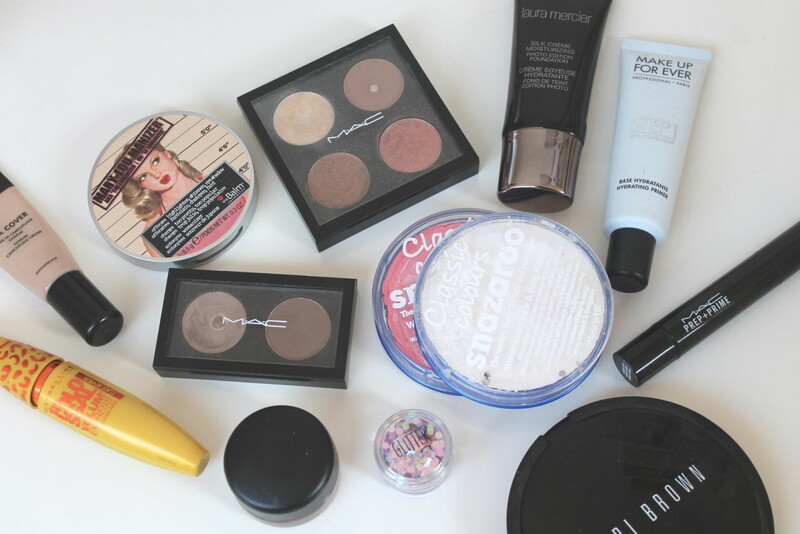 1- Prep: I used Mac Painterly paint pot to prime my eye lids. This prevents eyeshadows from creasing. 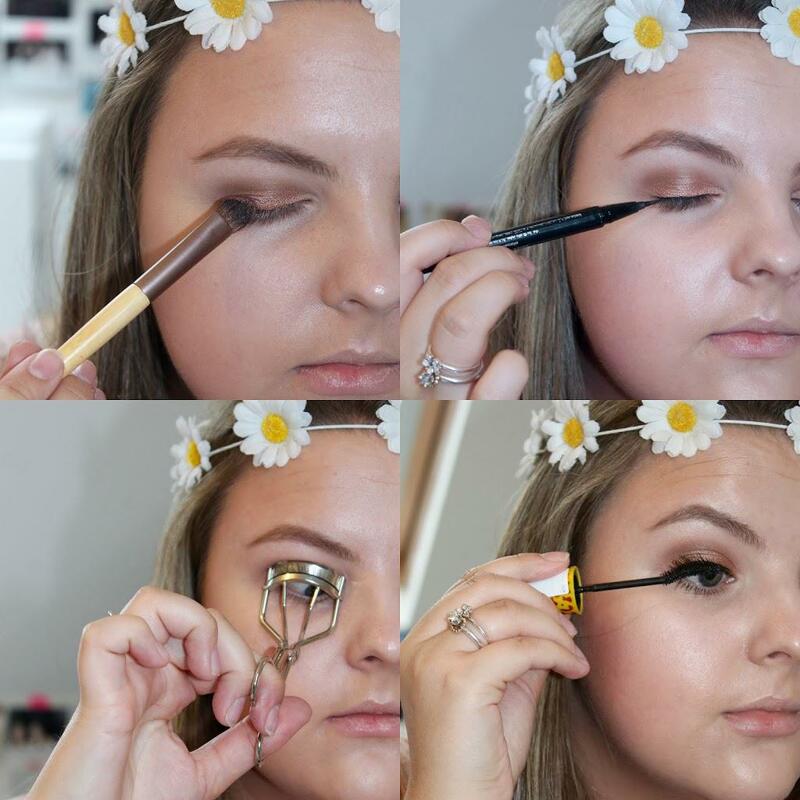 2- Brows: For my brows I used Maybelline master shape brow pencil in the shade soft brown. 3- Crease: I used Wedge eyeshadow by Mac as my transition and crease shade. Use a fluffy brush to apply this to the crease and blend blend blend. 4- Shadow: Using a flat eyeshadow brush apply Woodwinked by mac all over the lid and use a blending brush to blend it into the wedge shade. 5- Shimmer: For added sparkle, I added Mythology shadow by Mac over the top of woodwinked. 9- Highlight: Using Mac Nylon shadow I highlighted the inner corner and brow bone. 10- Sequins: To add extra sparkle to this look I used Topshop glitter in candy rain along my cheek bone. 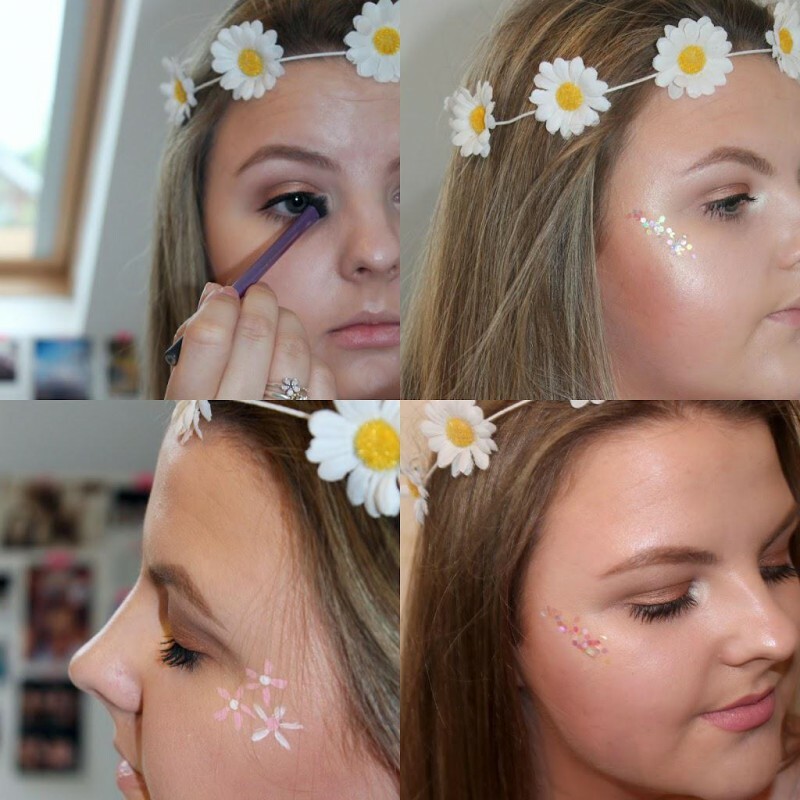 11- Face Paint: As a different option, you could also draw on small flowers near the outer edge of the eye using face paints. 12- Lips: On my lips I used Rimmel lip liner in Eastend Snob with Mac’s Pink Plaid matte lipstick on top. As I said at the beginning I kept the eyes simple but smokey, this will safe time at the festival and space in your bags. What do you think of the overall look? Be sure to follow me on Instagram because I’m sure I will be sharing my snaps from the weekend.